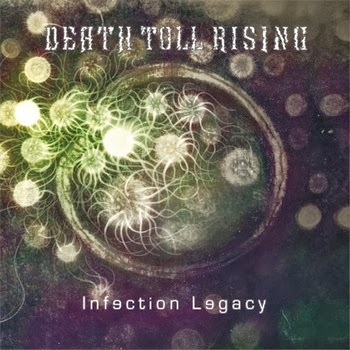 Infection Legacy is the sophomore album by Edmonton's Death Toll Rising. Thankfully the new album doesn't have any references to death by feces in the title like the last one. The death (metal) on hand here is more of the apocalyptic variety. For nine tracks over 47 minutes the Albertans go for broke with hard-hitting and edgy death metal. DTR blend a mix of chug and speed with subtle technicality. Two-toned death vokills (low/high) tear through chords as well as anyone else, and the drummer is pretty outstanding. One can hear the uh, legacy of classic DM bands in their sound but overall DTR sound fresh and modern. Ripping solos and scorching runs balanced by burliness and grit. It's a formula bound to ensnare plenty of death metal fans. But death metal is a tough genre. True innovators are hard to find. There are plenty of horrible DM bands though. But a good majority simply do death metal very well. DTR is one of those bands. Not much really stands out but as far as death metal goes, there's really nothing to complain about. Lots of aggression, tight musicianship, good vocals, and infectiously catchy riffs. Infection Legacy is worth checking out. You might even want to "Crack Open a Cold One" to go along with it. I mean beer, but that's not what the song is about. I don't know much about Fort McMurray, AB but I know that's where Until Dawn are from and that there isn't much other that going on there. I mean, my stepdad considered a job out there and my mom said she wouldn't go with him because it was too boring. And she's the biggest homebody I know. (Love ya, Ma!) But without big city distractions these guys had plenty of time to hone their chops for debut album Horizon. These lads can play. Riffs abound and dexterity is there in spades, but the issue at hand is stylistic. Until Dawn dig deep beneath the mines already picked clean by metalcore/melodic metal heavyweights like Killswitch Engage and Soilwork. I might even hear some Darkest Hour and The Haunted in there too. Given the base they're working from you can bet Horizon is packed with riffs that will get buried deep in your skull even if they aren't the most original. Some parts seem directly lifted from KsE. However, Until Dawn don't follow that good cop/bad cop vocal style to the same extent as KsE. There is varying degrees of intensity but even the cleaner side has some grit. By and large most of the tracks on Horizon are virtually interchangable. Which makes the fact there are 13 (including bonus tracks) seem a bit of overkill. Spicing things up a bit is “This Fallen Fortress” which starts almost Panterish before devolving into stock metalcore. “DNR” stands in as the ballad. “The Trial” has a bit of a different energy and feels a little nu-metallic. 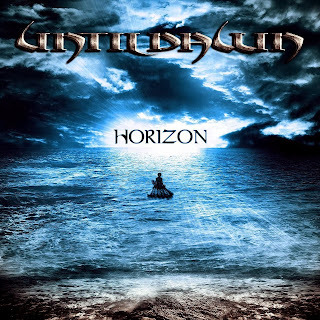 But as stated, Horizon is basically a well-executed and produced melodic metal album. No doubt there's a wide porton of metal fans who will eat this right up and know every word and sing along with just as much conviction to those big hooky choruses. These same fans will do their best to break their own necks to the syncopated rhythms slicing up the melodies. But when you break it right down, Until Dawn aren't breaking any new ground and will be hard pressed to draw in listeners that aren't already diehard fans of this niche genre. I have to give them credit for sticking to what they want to play, and doing it well for what it is. And at least they've got something to do.